Pictured left to right: Zach Weeks, Sean Scranton, Samantha Street and Seth Eggleston. TIPP CITY — Saturday, March 16, the Northmont Academic Challenge team defeated Beavercreek 310-80 to win the Frosh/Soph History Bowl State Championship at Tippecanoe High School. This is Northmont’s 2nd straight History Bowl state title and its 5th History state title since 2011 (13th state championship overall). 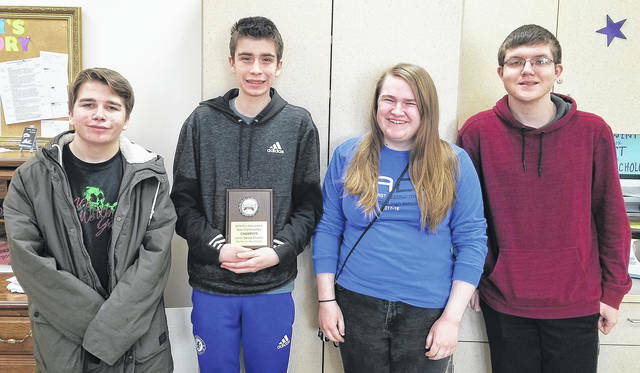 The team of Sean Scranton, Samantha Street, Zach Weeks and Seth Eggleston have not lost a history bowl event to another team in their age group all season. “We will be seeded in the top 10 at the national event next month when we will shoot for our 3rd history bowl national championship,” said coach David Jones. In 2018 Northmont won the state championship competition of the National History Bowl at Tippecanoe High School. Northmont defeated Beavercreek in the championship game to advance to the History Bowl National Championship competition in Washington D.C. This year the team will take a spring break trip to Georgia to compete in another tournament before going to Washington, D.C. for the national competition in April. The Northmont Academic Challenge Team is one of the most successful teams in the West Central region of Ohio. The team was founded in 1991 by Carol Roberts, who led the team to six consecutive regional appearances and 4 consecutive league titles. After Mrs. Roberts retirement from coaching in 2004, Bill Patrizio led the team for 2 years. David Jones took over the Northmont program midseason in 2005, competing only in GWOC league competition (4th place) and the UC Bearcat Buzzerbowl. The team reappeared on the state scene in 2006-2007, with captain Anna Henry leading the T-Bolts to a regionals appearance and a High-Q Final Four appearance. In 2012 and 2013, Sam Blizzard led Northmont to back-to-back National History Bowl Junior Varsity National Championships in Washington D.C., marking Northmont’s first ever national championship in any activity. In 2014, coach David Jones was named National History Bowl National Coach of the Year.